Today I welcome Dennis Keithly & Darth Taxus from the Starships, Sabers and Scoundrels podcast onto the show. But before I did, they kindly invited me onto THEIR podcast! Have a listen! If you don't have an hour to listen to us babble, then maybe you can spare us just five minutes of your time. Check out our LT12P discussion instead! Well, technically, not today, BUT, it was twenty years ago this year that the Star Wars Special Editions were released. Today's episode is part trip down memory lane, part opinion piece. Please have a listen, then be sure to tell me your thoughts and opinions on the cinematic rebirth of our favorite big screen saga! Well, it's that time of the month where I add a new classic Kenner action figure to my collection. This months figure is actually THREE figures! Why three? Listen to the episode to find out. So, what did I get? Well, listen to the episode to find out! Thank you to Adam for the new figgiest. Please check out Adam's awesome toy photography on Instagram. He can be found @Mandalorian40. If you have a figure I do not have already, and want to send it my way, please contact me. Email me at TwelveParsecsPodcast@gmail.com. I am looking for loose figures, in near mint condition, with their accessories. I am willing to pay a fair price, but I won't say no to freebies either! :-) And please, don't tell me what you have, I want to be surprised when I open the package! It's Friday, that means it is time for our weekly news round up! These are the headlines that caught my attention this week. And dont forget, you can win the Kanan-styled sleep mask. Simply post a sleep-themed Star Wars photo on Twitter, use the hashtag #SleepyStarWars and tag both @TwelveParPod and @SWSkyhoppers. What is a sleep-themed photo? Let us see your favorite Star Wars pajamas, or your bed with the Star Wars sheets, blankets and pillows, or maybe it's a photo of you snuggled up with your favorite Star Wars plush toy and bed time story book. Or anything else you can come up with! We will pull a name from random on February 28th! Thanks for playing, and good luck! Ash from The Skyhoppers Podcast was on the other day to talk about her awesome hand crafted Kanan styled sleep masks (Which you can win! See details below!). And like all guests on the show, I did not let her escape without first sitting through my 10 Stoopid Questions. Ten questions, and only ten seconds to answer each one! How did she do? Have a listen to find out! 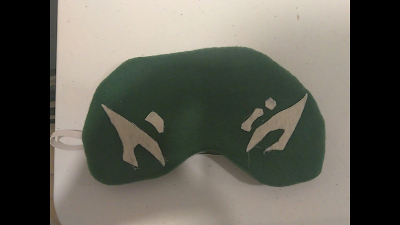 Okay, here's how you can win the Kanan-styled sleep mask. Simply post a sleep-themed Star Wars photo on Twitter, use the hashtag #SleepyStarWars and tag both @TwelveParPod and @SWSkyhoppers. What is a sleep-themed photo? Let us see your favorite Star Wars pajamas, or your bed with the Star Wars sheets, blankets and pillows, or maybe it's a photo of you snuggled up with your favorite Star Wars plush toy and bed time story book. Or anything else you can come up with! We will pull a name from random on February 28th! Thanks for playing, and good luck! While Less Than 12 Parsecs is far from a news oriented podcast, I still feel the need to comment on big Star Wars news when it breaks. And today, we learned the title of Episode VIII. It is "The Last Jedi". Please take four minutes to hear my thoughts on this title! As regular listeners will know, I've been trying to improve my Twitter game. Well, I had an exchange recently with Ash from The Skyhoppers Podcast. What did we talk about? Something so cool that I had to invite her on the show! Take five minutes to listen to our conversation, then come back to this page for more. Back? Okay, here's how you can win the Kanan-styled sleep mask. Simply post a sleep-themed Star Wars photo on Twitter, use the hashtag #SleepyStarWars and tag both @TwelveParPod and @SWSkyhoppers. What is a sleep-themed photo? Let us see your favorite Star Wars pajamas, or your bed with the Star Wars sheets, blankets and pillows, or maybe it's a photo of you snuggled up with your favorite Star Wars plush toy and bed time story book. Or anything else you can come up with! What happens when I'm too exhausted to think, and jacked up on so much caffeine that I dont know any better? You get an unscripted, mixed up episode like today's show! I just spew out a bunch of incomplete topics, nuggets of topics really, simply because I wanted to make a show because it's fun to make shows. Not to long ago I discovered a great website that is jammed packed with Star Wars, Sci-Fi and Fantasy news, reviews, editorials and interviews. That site is Roqoo Depot. Roqoo Depot also provides a great weekly recap and review of many Star Wars podcasts. LT12P has been lucky enough to be on the list a few times. And that got me wondering, who is doing all of this great work? Turns out it's a gentleman by the name of Stephen, who goes by the screen name Skuldren. I reached out to him and invited him on the show. He graciously agreed to come on, and this is our five minute conversation! And I just want to give a big thank you to Stephen for his patience. Eagle-eyed listeners will notice that this is listed as Episode 49. But I have already released Episodes 50 & 51. Well, due to a technical glitch while recording, I did not capture the last 40 seconds of our discussion. Stephen was extremely kind and patient and came back on the show a few days later to answer that one last question. Thanks Stephen! Oh, and yes, of course I made him sit through the 10 Stoopid questions. Look for that episode tomorrow! And one last thing, I am trying to track down Mike Schweg, bh1138 and Dexter Jettster. These are the screen names of three people who left me reviews on iTunes or Stitcher, and who won prizes in our recent giveaway. Please email me at TwelveParsecsPodcast@gmail.com so I can get your prizes into your hands! Thanks! After a year (and then some) away from the mic, Allen Voivod and I are back with The Expanded Comicverse! This is our monthly show where we discuss all the new Star Wars comics from Marvel Comics. This first episode of 2017 is just us catching up a bit, and discussing two of the storylines from 2016. Today, we're talking about "Rebel Jail," issues 16-19, and "The Last Flight of the Harbinger," issues 21-25. We promise that we will soon catch up and be back on schedule with episodes where we talk about the comics that just came out. Thanks for your patience! Every where I turned on-line today, people were speculating about how Lucasfilm is going to deal with the death of Carrie Fisher in Episode IX. While it feels a little too soon to me, sadly, it is a discussion we knew we would get to eventually. In today's episode, I voice my opinion about how they should move forward with the franchise, and I speculate on how this could effect the characters of Luke Skywalker and Kylo Ren. What do you think should happen? What do you think will happen? Please, email me at TwelveParsecsPodcast@gmail.com, or connect to me on any of my social media links! As long time listeners will know, before Rouge One came out, I was a bit worried about the big job that the Lucasfilm marketing job had in front of them. And as we got closer to the release date, I became a bit critical of what they were doing. So, what do I think, now that the film is out? Well, take 4 minutes and 47 seconds to find out! In this episode I ask some questions that I would like to hear your thoughts on. Please, email me at TwelveParsecsPodcast@gmail.com, or connect to me on any of my social media links! Happy New Year everyone! Have you made any New Year Resolutions? I have, and they are all Star Wars oriented. Have a listen to hear, and then please, tell me about yours! Also, I've extended the end of the year Star Wars merchandise give-away contest until January 11th. Have a listen to learn why.